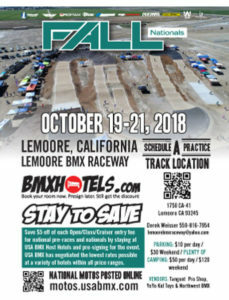 Join Bay Area BMXers for the 2018 Fall Nationals in Lemoore, California! Call and make a reservation by at the Tachi Palace Hotel and Casino at 800-615-8030. Don’t forget to mention the BMX GROUP CODE: “SRAABA” to receive the discounted rate. The rate for both singles and doubles is $130 per night. There is also an executive suite available for $199 per night. EMAIL JEN@USABMX.COM WITH YOUR CONFIRMATION CODE AND SHE WILL RESPOND WITH YOUR BMX CODE. Contact Bay Area BMXers for questions about any upcoming events. Bay Area BMXers is a new, one of its kind, grass roots, Non-Profit organization. Our purpose is to invest in training at-risk youths for State and National BMX bike races, which promotes self-reliance and economic independence. Our organization is growing and thriving because of support from the local business community and the public. If you'd like to be a part of our program, and make a difference in the lives of Bay Area kids, please contact us to find out how to contribute or become a sponsor. Copyright (c) 2018 Bay Area BMXers.